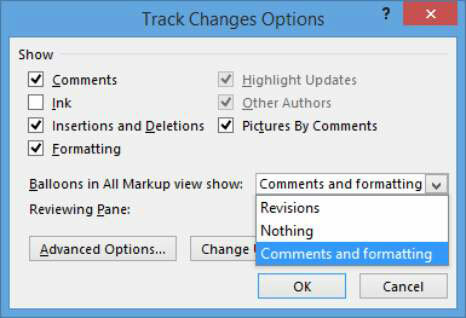 Comments appear, by default in Word 2013, in balloons to the right of the document, like some revisions do. They also appear in the Reviewing pane, if displayed. When multiple users add comments to a document, each person’s comments appear in a different color balloon (or bar in the Reviewing pane, if balloons are disabled). 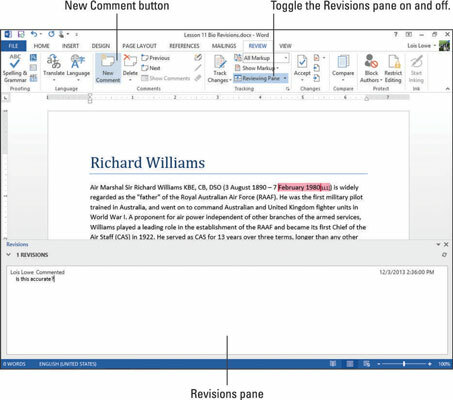 If a user makes revisions and adds comments to the document, their revision marks and comment balloons are the same color. In your Word 2013 document, select a paragraph, and then choose Review→New Comment. The Reviewing pane appears below the document (because that’s the last location you specified for it). Balloons don’t appear for comments because you turned off that feature in an earlier exercise. The insertion point moves to the comment. In this example, February 1980 was selected with the comment, Is this accurate?. The text you type appears in the Reviewing pane, under the Comment heading. On the Review tab, click the dialog box launcher in the Tracking group. From the Balloons in All Markup View Show drop-down list, choose Comments and Formatting and then click OK. The comment appears in a balloon to the right of the document. Choose Review→Reviewing Pane (the button face, not the arrow) to turn off the Reviewing pane. The Reviewing pane is no longer needed because the comments already appear. Here is the comment in a balloon. Scroll to the bottom of the document, select another sentence or word and then choose Review→New Comment. A new comment balloon appears. Type your new comment and then press Ctrl+Home to return to the top of the document.